Berneim, Meyo-Bug, Cushieri, Ishida 1911 proposed the role of laparoscopy as a staging tool for pancreatic diseases. But yet usage of laparoscopy in pancreatic tumor has been very slow. We retrospectively studied use of laparoscopy for various pancreatic tumors in our institution from July 2005-june 2009. 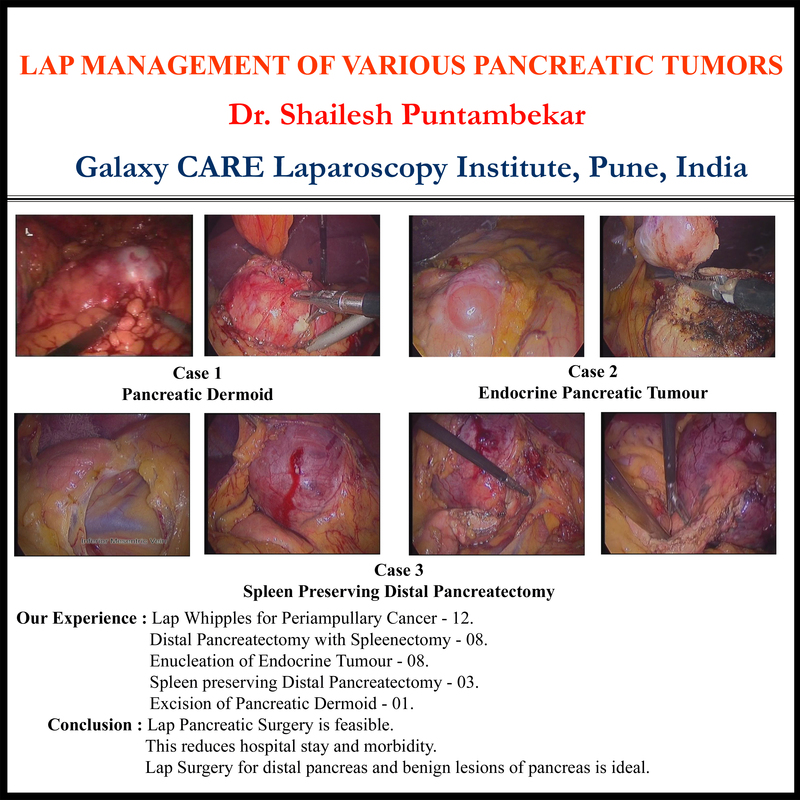 Laparoscopy was used for staging of pancreatic carcinoma, resection of benign and malignant pancreatic diseases. Palliation (gastrojejunostomy/ choledochojejunostomy) in pancreatic cancer. We performed diagnostic laparoscopy for all our patients of pancreatic cancers. We detected metastasis in 4-15% patient’s with no evidence of metastasis on CT scan. In locally advanced inoperable cases of pancreatic head cancer we performed laparoscopic gastroenterostomy if patient had preoperative symptoms of gastric outlet obstruction. We have performed gastrojejunostomy in 6 patients. We have performed laparoscopic pancreatioduodnectomy in 7 patients. We perform the complete dissection and separation of specimen laparoscopically and do the anastomosis extracorporeally. The average time taken was 6hrs and blood loss was 500ml. Post operative morbidity was seen in two patients and mortality in one patient. We have performed enucleation for benign pancreatic tumors in 10 patients with average operative time 100 min, hospital stay 5days and no intra and post operative complications. Distal pancreatectomy with spleen preservation was performed in two patients. Laparoscopic pancreatic surgery can be accomplished safely but requires understanding of pancreatic diseases, experience in open pancreatic surgery, advanced laparoscopic skills.